A look at modern relationships, romance, fame, etc. as a Jewish comic (Allen) recalls his long love affair with Annie (Keaton). 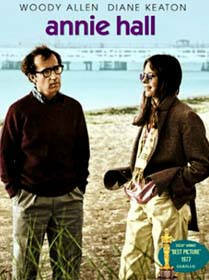 Woody Allen (who also won the Oscar for direction). With Carol Kane, Paul Simon, Shelly Duvall, Colleen Dewhurst, and Christopher Walken. Charles H. Joffe ( - ) American producer who works almost entirely with Woody Allen. Joffe's other works include: TAKE THE MONEY AND RUN, BANANAS, SLEEPER, LOVE AND DEATH, and ZELIG. Woody Allen and Marshall Brickman received the Screenplay (Written directly for the Screen) Oscar. Carefully watch for future stars: Jeff Goldblum, Sean Young, Shelley Hack, Beverly D'Angelo, and Sigourney Weaver in small parts.